Jewellery is a universal form of adornment. Jewellery made from shells, stone and bones survives from prehistoric times. It is likely that from an early date it was worn as a protection from the dangers of life or as a mark of status or rank. Gold, a rare and highly valued material, was buried with the dead so as to accompany its owner into the afterlife. Much archaeological jewellery comes from tombs and hoards. Sometimes, as with the gold collars from Celtic Ireland which have been found folded in half, it appears people may have followed a ritual for the disposal of jewellery. The jewellery worn in medieval Europe reflected an intensely hierarchical and status-conscious society. Royalty and the nobility wore gold, silver and precious gems. Lower ranks of society wore base metals, such as copper or pewter. Colour (provided by precious gems and enamel) and protective power were highly valued. Some jewels have cryptic or magical inscriptions, believed to protect the wearer. Until the late 14th century, gems were usually polished rather than cut. Size and lustrous colour determined their value. Enamels - ground glasses fired at high temperature onto a metal surface - allowed goldsmiths to colour their designs on jewellery. They used a range of techniques to create effects that are still widely used today. 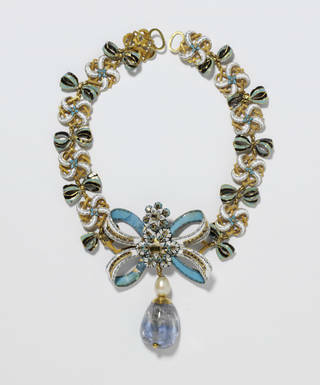 Renaissance jewels shared the age's passion for splendour. Enamels, often covering both sides of the jewel, became more elaborate and colourful and advances in cutting techniques increased the glitter of stones. The enormous importance of religion in everyday life could be seen in jewellery, as could earthly power - many spectacular pieces were worn as a display of political strength. The designs reflect the new-found interest in the classical world, with mythological figures and scenes becoming popular. The ancient art of gem engraving was revived and the use of portraits reflected another cultural trend - an increased artistic awareness of the individual. Particular types of stone were thought to protect against specific ailments or threats, ranging from toothache to the evil eye. They could also encourage or banish such characteristics as bravery or melancholy. 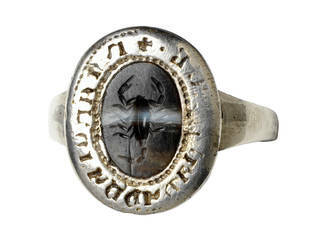 This scorpion etching dates from the 2nd or 1st century BC but has been reused in a medieval ring. Carved Greek or Roman stones were highly valued in the middle ages. 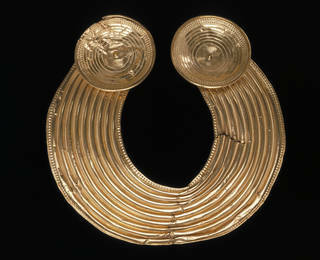 They were found in excavations or in surviving earlier pieces of jewellery and traded across Europe. The scorpion had an enduring reputation as a protective amulet. It was believed to heal patients from poisoning and also, as symbol of the Zodiac sign Scorpio, it was associated with water and therefore believed to have a cooling effect on fever. Remedies against poisoning were also made by infusing scorpions in oil and herbs. The Medici Grand Duke Francesco I (d. 1587) published a recipe for an anti-poison oil effective against 'all sorts of poisons ingested by mouth, stings and bites'. By the mid-17th century, changes in fashion had introduced new styles of jewellery. While dark fabrics required elaborate gold jewellery, the new softer pastel shades became graceful backdrops for gemstones and pearls. Expanding global trade made gemstones ever more available. Advances in cutting techniques increased the sparkle of gemstones in candlelight. The most impressive jewels were often large bodice or breast ornaments, which had to be pinned or stitched to stiff dress fabrics. The swirling foliate decoration of the jewels shows new enthusiasm for bow motifs and botanical ornaments. The central bow in this necklace is a magnificent example of a mid-17th century jewel. The painted opaque enamel was a recent innovation, said to have been developed by a Frenchman, Jean Toutin of Châteaudun. This striking colour combination was frequently used in enamels around this date. The end of the previous century had seen the development of the brilliant-cut with its multiple facets. Diamonds sparkled as never before and came to dominate jewellery design. Frequently mounted in silver to enhance the stone's white colour, magnificent sets of diamond jewels were essential for court life. The largest were worn on the bodice, while smaller ornaments could be scattered over an outfit. Owing to its high intrinsic value, little diamond jewellery from this period survives. Owners often sold it or re-set the gems into more fashionable designs. From around 1640, light swords with short, flexible, pointed blades appeared in response to new fencing techniques that emphasised thrusting at speed. They were worn increasingly with civilian clothes as ‘small swords’, offering a means of self-defence but largely denoting status for the well-dressed gentleman. Small swords were items of male jewellery. 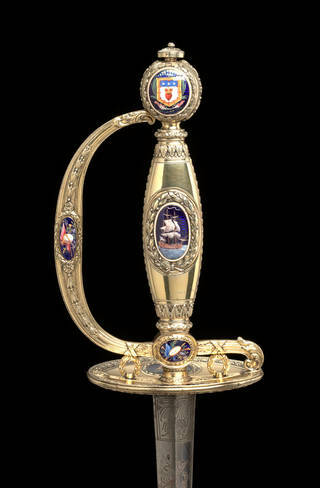 By the 1750s, their elaborate gold and silver hilts, mounted with precious stones and fine enamelling, were the products of the goldsmith and jeweller rather than the swordsmith. They were often given as rewards for distinguished military and naval service. The 19th century was a period of huge industrial and social change, but in jewellery design the focus was often on the past. In the first decades classical styles were popular, evoking the glories of ancient Greece and Rome. This interest in antiquities was stimulated by fresh archaeological discoveries. Goldsmiths attempted to revive ancient techniques and made jewellery that imitated, or was in the style of, archaeological jewellery. 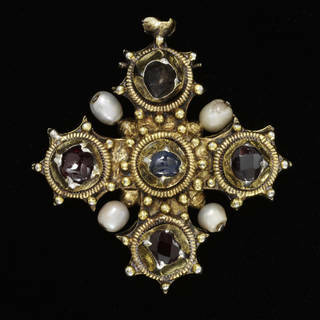 There was also an interest in jewels inspired by the Medieval and Renaissance periods. It is a testament to the period's eclectic nature that jewellers such as the Castellani and Giuliano worked in archaeological and historical styles at the same time. Naturalistic jewellery, decorated with clearly recognisable flowers and fruit, was also popular for much of this period. These motifs first became fashionable in the early years of the century, with the widespread interest in botany and the influence of Romantic poets such as Wordsworth. This large spray of assorted flowers has a pin fastening at the back and would have been worn as a bodice ornament. 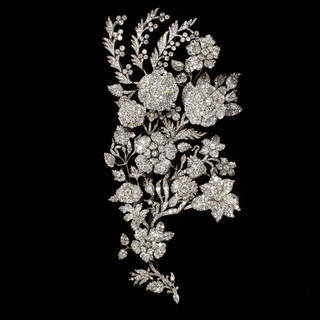 Some of the diamond flowers are set on springs, which would increase their sparkle considerably as the wearer moved. Individual flower sprays could be removed and used as hair ornaments. Developing in the last years of the 19th century, the Arts and Crafts movement was based on a profound unease with the industrialised world. Its jewellers rejected the machine-led factory system - by now the source of most affordable pieces - and instead focused on hand-crafting individual jewels. This process, they believed, would improve the soul of the workman as well as the end design. Arts and Crafts jewellers avoided large, faceted stones, relying instead on the natural beauty of cabochon (shaped and polished) gems. They replaced the repetition and regularity of mainstream settings with curving or figurative designs, often with a symbolic meaning. The designer of this brooch, C. R. Ashbee, was a man of immense talents and energy and a defining figure in the Arts and Crafts Movement. In 1888 he founded the Guild of Handicraft in the East End of London with the intention of reviving traditional craft skills and providing satisfying employment in a deprived area of the city. Trained originally as an architect, he is known also for his highly innovative furniture, metalwork, silver and jewellery designs. 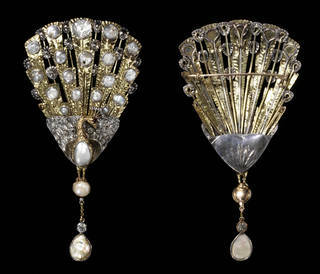 The peacock was one of Ashbee's favourite and most distinctive motifs and he is known to have designed about a dozen peacock jewels in the years around 1900. Family tradition is that this brooch was designed for his wife, Janet. It was made by Ashbee's Guild of Handicraft Ltd. at Essex House on the Mile End Road, London. 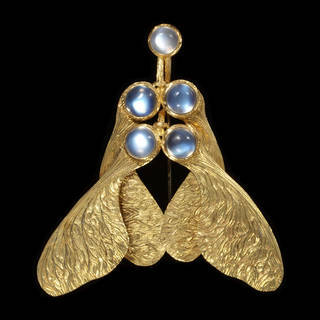 The Art Nouveau style caused a dramatic shift in jewellery design, reaching a peak around 1900 when it triumphed at the Paris International Exhibition. Its followers created sinuous, organic pieces whose undercurrents of eroticism and death were a world away from the floral motifs of earlier generations. Art Nouveau jewellers like René Lalique also distanced themselves from conventional precious stones and put greater emphasis on the subtle effects of materials such as glass, horn and enamel. However, the style's radical look was not for everyone or for every occasion. Superb diamond jewellery was made in the 'garland style', a highly creative re-interpretation of 18th- and early 19th-century designs. 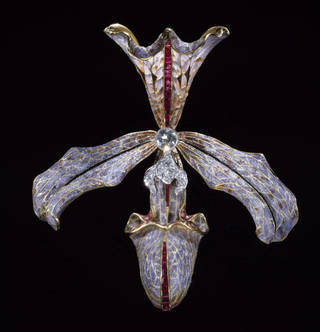 The maker of this orchid hair ornament, Philippe Wolfers, was the most prestigious of the Art Nouveau jewellers working in Brussels. Like his Parisian contemporary René Lalique, he was greatly influenced by the natural world. These exotic orchids feature in the work of both. The technical achievement of enamelling in plique-a-jour (backless) enamel on these undulating surfaces is extraordinary. Although buffeted by cycles of boom, depression and war, jewellery design between the 1920s and 1950s continued to be both innovative and glamorous. Sharp, geometric patterns celebrated the machine age, while exotic creations inspired by the Near and Far East hinted that jewellery fashions were truly international. New York now rivalled Paris as a centre for fashion, and European jewellery houses could expect to sell to, as well as buy from, the Indian subcontinent. Dense concentrations of gemstones are characteristic of Art Deco jewellery. From about 1933 gold returned to fashion, partly because it was cheaper than platinum. Artists and designers from other fields also became involved in jewellery design. 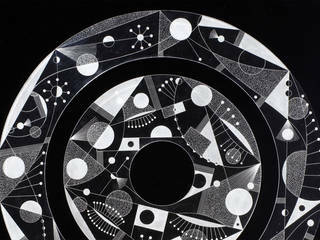 Their work foreshadows the new directions jewellery would take. 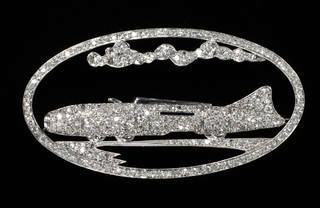 This brooch commemorates the breaking of the World Land Speed Record by Captain George Eyston in 1937. The car depicted is Thunderbolt, which Captain Eyston designed, built and drove. It was powered by two aero engines made by the firm of Rolls-Royce, which presented the brooch to Captain Eyston’s wife. Since the 1960s the boundaries of jewellery have been continually redefined. Conventions have been challenged by successive generations of independent jewellers, often educated at art college and immersed in radical ideas. 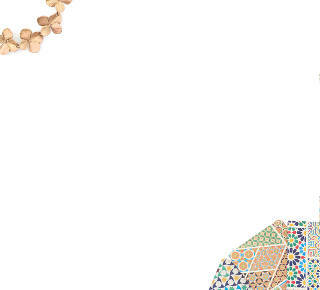 New technologies and non-precious materials, including plastics, paper and textiles, have overturned the notions of status traditionally implicit in jewellery. Avant-garde artist-jewellers have explored the interaction of jewellery with the body, pushing the boundaries of scale and wearability to the limits. Jewellery has developed into wearable art. The debate on its relationship to Fine Art continues.